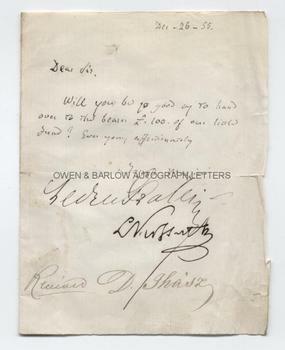 GIUSEPPE MAZZINI, LOUIS KOSSUTH and ALEXANDRE LEDRU-ROLLIN Autograph Letter Signed by all three. Giuseppe (Joseph) Mazzini (1805-1872) Italian patriot who, with Garibaldi and Cavour led the movement for the unification of Italy; Louis (Lajos) Kossuth (1802-1894) Hungarian revolutionary and first president of independent Hungary; Alexandre Auguste Ledru-Rollin (1807-1874) French revolutionary politician. The triumvirate who styled themselves the Revolutionary Council of Europe whilst in exile in London. ALS. 1p. No place. December 26th 1855. 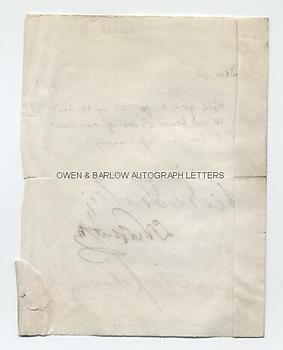 The text of the letter is in the hand of Mazzini and is signed by all three. "Dear Sir, Will you be so good as to hand over to the bearer £100 of our little fund? Ever yours affectionately, Joseph Mazzini, Alexandre Ledru-Rollin, L. Kossuth." Endorsed at foot "Received. D. Ihasz." 12mo. Approx 5.25 x 4 inches. Lacking integral blank leaf. Some fraying and creasing to right edge. All else very good. A remarkable and rare letter, signed by the three prominent European revolutionary leaders. The £100 from the fund referred to in this letter was payed to Daniel Ihasz (1813-1881), who has acknowledged receipt at the foot. Ihasz was a colonel in the Hungarian army in 1848-49 who commanded the Hungarian Legion in the revolutionary war for the unification of Italy. It appears, therefore, that the payment (raised from British radical sympathisers) was intended to fund Ihasz's expenses in his armed insurrection in Italy.